ABSTRACT. Cystic kidney disease has been linked to mutations in the Invs gene in mice with inversion of embryonic turning (inv/inv) and the INVS (NPHP2) gene in infants with nephronophthisis type 2 (NPHP2). The inv mouse model features multiorgan defects including renal cysts, altered left-right laterality, and hepatobiliary duct malformations transmitted in an autosomal recessive manner. Affected mice usually die of renal and liver failure by postnatal day 7. Although cardiopulmonary and liver anomalies have been carefully detailed, renal cysts have yet to be fully characterized in inv/inv. By use of three-dimensional visualization by two-photon microscopy, this study provides the first comprehensive analysis of in situ cyst formation and progression in inv/inv kidneys. At embryonic day 15, there is dilatation of Bowman’s capsule followed temporally by corticomedullary cysts involving collecting ducts, proximal tubules, and thick ascending limbs. Collecting ducts of newborn inv/inv mice are uniformly and diffusely cystic from medulla to cortex, with normal diameters found only at their most proximal tips. Proximal tubules form fusiform cysts that alternate with segments of normal or narrowed caliber along torturous convolutions. 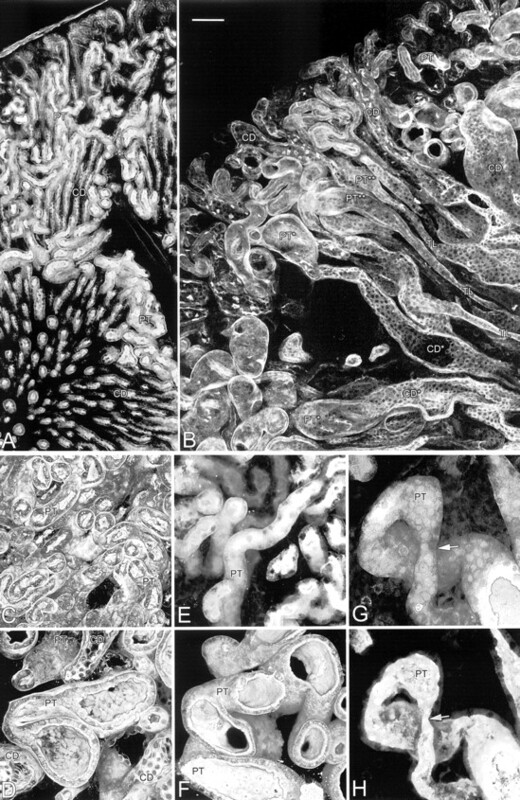 Because defective cilia have been linked to situs inversus and cystogenesis, we examined inv/inv cilia by scanning and transmission electron microscopy. The former detected monocilia of expected length in cystic collecting ducts and proximal tubules; the latter demonstrated the usual 9 + 2 pattern in respiratory cilia. The inv mutant mouse has renal cysts resembling infantile NPHP2 and will provide broader insight into the role cilia play in renal cystogenesis. Inherited cystic kidney diseases comprise a large category of disorders characterized by cystic kidneys and multiorgan pathology. Both autosomal recessive and autosomal dominant patterns of transmission have been described in humans and murine models (1). Regardless of the gene defect in humans, cystic expansion of epithelial-lined renal tubules leads to progressive loss of renal function and eventual dependence on dialysis or transplantation. Autosomal dominant polycystic kidney disease (ADPKD) is symptomatic in adulthood and attributed to mutations in the PKD1 gene encoding polycystin-1, and PKD2 encoding polycystin-2 (2). A number of gene mutations have been recently described in infants and children with renal cysts (3) including PKHD1 underlying autosomal recessive polycystic kidney disease (ARPKD) (4,5⇓), NPHP1 in juvenile NPHP1 (6), INVS in infantile nephronophthisis type 2 (NPHP2) (7), NPHP3 in adolescent NPHP3 (8), and NPHP4 in a second juvenile form (9). Although a complex cascade of proteins is known to influence tubulogenesis (10) and maintain normal renal function, less is understood about how certain gene mutations initiate cystogenesis. Renal cysts arise from unchecked proliferation of epithelial cells, loss of epithelial cell polarity, and defects in epithelial communication with an altered extracellular matrix (11–13⇓⇓). These perturbations may be explained, in part, by disruption of calcium homeostasis that is normally maintained when polycystin-1 and -2 interact to regulate cation channels (2). The interaction of polycystins with NPHP gene products is unknown but the answer may be found in cilia and junctional complexes. Flow generated by motile cilia in the embryonic node appears to establish the left-right vertebrate axis (14), whereas nonmotile, primary cilia on the apical surface of renal tubular cells are postulated to act as mechanosensory receptors (15). Primary cilia may detect changes in urine flow or content and transmit signals to junctional complexes to regulate epithelial cell differentiation. Inversin, the product of Invs, has recently been found in cilia (16,17⇓) as have other cyst-associated proteins including cystin (18), polaris (19), polycystin-1 and -2 (20,21⇓), fibrocystin (4), and nephrocystin (7), adding further evidence to the postulated role of defective cilia assembly as a proximate cause of renal cysts. A relationship between cilia and junctional complexes is suggested by colocalization of polycystin-1 with E-cadherin and the catenins (22), inversin with N-cadherin and the catenins (23), and nephrocystin with inversin (7). Development of animal models that reliably mimic human disease will facilitate the study of cyst-associated proteins in organelles such as cilia. Invs is one of several murine genes associated with renal cysts, but inv/inv mice were also reported to have alterations in left-right asymmetry, cardiovascular defects, an anomalous hepatobiliary system, and premature death (24–29⇓⇓⇓⇓⇓). Although INVS has been sequenced and mapped in humans (as NPHP2) (7,30⇓) and mice (as Invs), the function of inversin is unknown. Initial reports of the inv mutant model noted renal cysts in two-dimensional (2-D) histologic sections of newborn kidneys shown at relatively low magnifications. Kidneys of affected newborn mice were described as having “severely dilated collecting ducts,” whereas heterozygotes had no phenotypic abnormalities (24,27⇓). Morgan et al. (17) reported normal appearing monocilia in kidneys but did not designate the tubule segment. We carefully studied inv mutants as a model of early infantile nephronophthisis and characterized renal changes from embryonic through postpartum development by use of bright-field and electron microscopy and two-photon fluorescence microscopy with three-dimensional (3-D) analysis. To understand the genesis of renal cysts, we used two-photon microscopy and digital image processing to generate 3-D images of in situ cysts. Compared with confocal microscopy, two-photon microscopy more efficiently collects scattered fluorescence without significant photobleaching of fluorescently labeled, thick biologic specimens (31). Because fluorescence probes may be targeted to specific renal molecules, two-photon technology is ideal for determining the relationship of renal cysts to contiguous and adjacent nephron segments and surrounding matrix. 3-D images produced by volume-rendering software that uses two-photon data are less labor intensive in acquisition and offer more information than microdissection or conventional 2-D techniques (32–34⇓⇓). Handling of mice conformed to institutional animal care guidelines established by the National Institutes of Health. After halothane inhalation and nuchal dislocation, a laparotomy was performed on pregnant mice, and embryos were removed at days E15 or E17 and fixed in 10% buffered formalin for histology. Kidneys harvested from newborn mice at postpartum day 1 (P1), day 5 (P5), and day 11 (P11) were fixed in 10% buffered formalin (Fisher Scientific, Fair Lawn, NJ) for bright-field microscopy. Day P2 to P5 kidneys were immersion-fixed in 4% paraformaldehyde (Fisher Scientific) for two-photon microscopy (31). Kidneys and trachea were fixed in 3% glutaraldehyde-formaldehyde in 0.1 M sodium cacodylate (Tousimis, Rockville, MD) for scanning electron microscopy (SEM) or transmission electron microscopy (TEM). Lack of pigmentation in albino control mice (+/+) allowed for phenotypic distinction from homozygotes (inv/inv) with situs inversus, or heterozygotes (inv/+) with intact left-right asymmetry (24,27⇓). Body and kidney weights were collected on a range of newborn mice available at time of study. All formalin-fixed kidneys were embedded in paraffin, sectioned 3 to 4 μm in thickness, and stained with periodic acid–Schiff. 2-D sections were collected with a Leica DMLB microscope (Bannockburn, IL) equipped with a Polaroid DMC digital camera (Bedford, MA). Two kidneys from each animal (inv/inv, inv/+ and +/+) were examined at E15 (n = 2), E17 (n = 4), P1 (n = 6), and P11 (n = 1). A tubule was deemed cystic if the diameter was twice that of +/+ littermates. SEM of kidney was performed on an Amray 1000A (KLA Tencor, Bedford, MA). For TEM, thin sections of trachea were examined on a Philips CM10 TE (FEI, Mahwah, NJ). Two inv/inv and +/+ animals were examined by each method as described (35). Paraformaldehyde-fixed kidneys were Vibratome sectioned up to 200 μm thick (Technical Products International, Inc., St. Louis, MO), washed in 1 × PBS, and incubated overnight (4°C) with one or more of the following: (1) rhodamine- or fluorescein-labeled lectins (Vector Labs, Burlingame, CA), (2) rhodamine-phalloidin (Molecular Probes, Eugene, OR), which labels filamentous (F) actin and/or (3) Tamm-Horsfall protein antibody (Biomedical Technologies, Stoughton, MA), to label thick ascending limb of Henle. Fluorescein-goat anti-rabbit (Jackson Immunoresearch, West Grove, PA) was used as secondary antibody for Tamm-Horsfall antibody. Peanut agglutinin (PNA) and Dolichos biflorus (DBA) lectins label collecting ducts. PNA and Lotus tetragonolobus (LTG) label proximal tubules. Lectins, phalloidin, and antibodies were diluted 1:200 in 2% BSA, 0.1% Triton X-100, and 1× PBS (Fisher Scientific). After a 4-h wash in 1× PBS, sections were placed on glass coverslips mounted to No. 1.5 culture dishes (MatTek, Ashland, MA). Formalin-fixed, paraffin-embedded, 5-μm-thick sections of newborn kidney (day P1) were deparaffinized through a xylene-ethanol gradient, labeled with DBA lectin followed by anti-DBA antibody, and developed with diaminobenzidine as chromagen (Vector Labs). Optical sections were collected on a Bio-Rad MRC1024 confocal/2 photon system (Bio-Rad, Hercules, CA) fitted to a Nikon Eclipse inverted microscope with ×20, ×40, or ×60 water-immersion objectives (Nikon, Melville, NY) at the Indiana Center for Biological Microscopy (http://nephrology.iupui.edu/imaging). Illumination was provided by a Spectra-Physics (Mountain View, CA) Tsunami Lite Titanium-Sapphire laser tuned to a wavelength of 800 nm. The objective collar was matched to the coverslip thickness. Data sets were collected as Z-series spaced from 0.4 μm (×60 objective) to 1.0 μm (×20 objective). 3-D images were produced by Voxx (36), a volume rendering program (available free from http://nephrology.iupui.edu/imaging/voxx). Segmentation and surface rendering of tubule luminal space was performed with Amira (TGS, San Diego, CA). Adobe Photoshop (San Jose, CA) was used to assemble and label final figures. 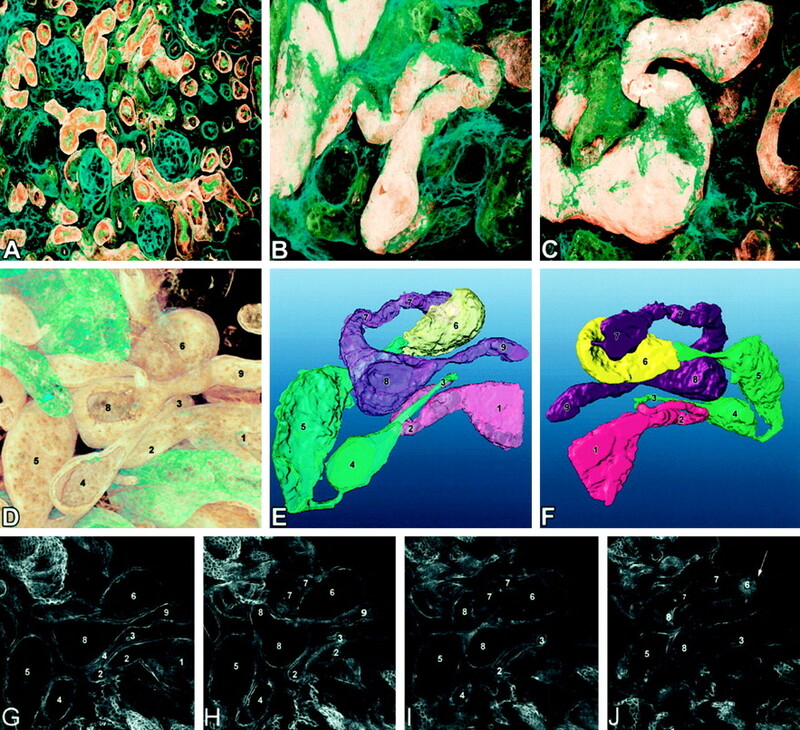 To generate composites of Vibratome kidney sections, neighboring Z-series were collected via two-photon microscopy, rendered in Voxx, saved as TIFF files, and assembled in mosaics by Adobe Photoshop. inv/inv exhibit situs inversus (Figure 1) and usually die within the first week of life, although one pup survived to P11. +/− mice followed up to 1 yr do not exhibit significant gross abnormalities (data not shown). Compared with age-matched +/+ littermates, inv/inv mice showed poor body growth, jaundice and developed progressively enlarging renal cysts (Figure 2). By day P5, inv/inv mice were azotemic with twice the concentration of blood urea nitrogen as compared with unaffected (+/+ and +/inv) littermates (data not shown). Figure 1. (top) Day P5 wild-type (+/+) and mutant (inv/inv) mice. The mutant mouse had decreased body size, yellow discoloration of skin, and cystic kidneys. Spleen (short arrows) and the apex of the heart (long arrows) are on the right side of inv/inv and the left side of +/+ littermate. The bottom panel shows larger cystic kidneys of an inv/inv as compared with normal-sized kidneys from a +/+ littermate. Figure 2. Graphs showing kidney (A) and body (B) mass of inv/inv (▪) mice compared with +/+ control littermates (♦) during the first week of life. (A) Cystic kidneys of P7 inv/inv mice weighed more than twice as much as +/+ kidneys. (B) Body weight of +/+ mice progressively increased whereas little weight gain was noted in inv/inv mice (n = number of mice per time point available). We inspected 2-D histologic sections of formalin-fixed, paraffin-embedded kidneys from embryonic (days E15, E17) and postpartum (days P1, P11) mice with bright-field microscopy. Relatively rapid development and progression of epithelial-lined cysts were found in nephrons of inv/inv mice (Figure 3). Expansion of Bowman’s space surrounding deep cortical glomeruli was the earliest defect observed in E15 inv/inv (Figure 3B), and this feature persisted through day P11 (Figure 3F). By day E17, cysts began to appear in collecting ducts and proximal tubules (data not shown) and these progressed in size and number in the cortex and medulla of newborn day P1 mice (Figure 3, C and D), whereas kidneys of age-matched +/inv and +/+ littermates developed normally (data not shown). Day P11 inv/inv kidneys showed diffuse and elaborate cystic expansion of proximal tubules, collecting ducts, and Bowman’s space (Figure 3F) that was similar but more extensive than was seen at day P1. A few inv/inv tubular lumina (<5%) contained dystrophic calcifications (data not shown). Kidneys from +/+ and +/inv kidneys showed densely packed tubules with normal nephron development at day P11 (Figure 3E). Figure 3. 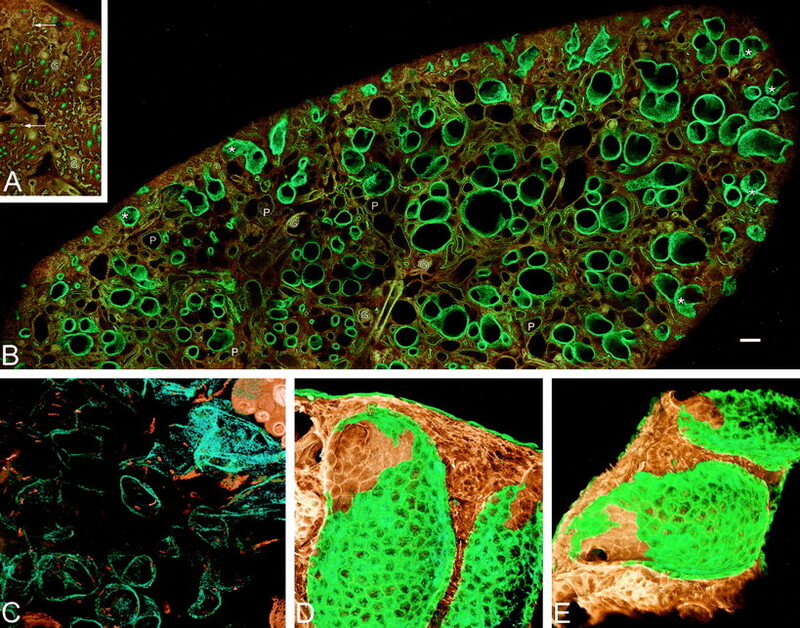 Two-dimensional, bright-field microscopic images of periodic acid–Schiff–stained kidneys. (A) +/+, day E15 (original magnification, ×200). (B) inv/inv, day E15 (original magnification, ×200). Expansion of Bowman’s space surrounding deep cortical glomeruli (open arrows) was noted in day E15 inv/inv kidneys (B) but not +/+ (A). (C) inv/inv, day P1 (original magnification, ×40). (D) inv/inv, day P1 (original magnification, ×200). Cysts involving collecting ducts, proximal tubules and Bowman’s spaces (*) are seen in P1 inv/inv. (E) +/+, day P11 (original magnification, ×40). (F) inv/inv, day P11 (original magnification, ×40). When compared with the dense parenchyma of +/+ kidney at day P11 (E), inv/inv shows diffuse cortical and medullary cysts (F). Two-Photon Fluorescence Microscopy and 3-D Rendering. Vibratome sections of paraformaldehyde-fixed newborn mouse kidneys (P2 to P5) were labeled with fluorescently tagged lectins, phalloidin, and/or anti–Tamm-Horsfall. Z-series of optical slices from each tissue section were acquired on a two-photon microscope and explored in near–real time by Voxx (Figures 4 through 9⇓⇓⇓⇓⇓). Figure 4. Single-channel, two-photon microscopy and three-dimensional rendering of day P5 proximal tubules (PT), thin descending loops of Henle (TL), and collecting ducts (CD). (A) +/+, PNA lectin, six adjacent Z-series assembled into one image. (B) inv/inv, PNA lectin, six adjacent Z-series with longitudinal orientation of tubules. Manual rotation of individual volumes in Voxx distinguished PT and CD that falsely appear connected in nonrotated state (*). Dilated S3 segments of PT (**) narrow distally into TL. Scale bar for A and B = 100 μm. (C) +/+, PNA lectin, 205 μm (x-axis) × 205 μm (y-axis) × 77 μm (z-axis). (D) inv/inv, PNA lectin, 205 × 205 × 79 μm. (E) +/+, LTG lectin, 205 × 205 × 42 μm. (F) inv/inv, LTG lectin, 205 × 205 × 88 μm. (G and H) inv/inv, LTG lectin, 180 × 180 × 66 μm. Surface of PT is rendered opaque in G and transparent in H to visualize attenuated lumen (arrow). Figure 5. Two-photon microscopy, three-dimensional rendering and segmentation of proximal tubules. (A) +/+, day P5, 205 (x-axis) × 205 (y-axis) × 31 μm (z-axis); (B) inv/inv, day P5, 205 × 205 × 29 μm; (C) inv/inv, day P5, 205 × 205 × 60 μm. Cystic proximal tubules (PNA-lectin, tan in B and C) were surrounded by relatively abundant F-actin in the interstitium (phalloidin, green in A through C). (E, F) Segmentation with Amira revealed in situ fusiform cysts, hairpin turns and narrowed segments in a single day P4 convoluted proximal tubule (tan in D, original volume, 512 × 512 × 91 μm, with DBA-labeled collecting ducts [green]; E = translucent, front view; F = opaque, back view). (G–J) Optical two-dimensional (2-D) slices at 10-μm intervals, taken from the volume rendered in (D), show cysts with narrowed segments (J, arrow). The numbers 1 to 9 in panels D through J allow comparison of 2-D and three-dimensional renderings. Figure 6. Dual-color, two-photon microscopy and three-dimensional rendering of day P2 +/+ (A) and inv/inv (B) show collecting ducts (DBA lectin, green) in relationship to proximal tubules (LTG lectin, tan). Arrows indicate thin descending loops of Henle that in inv/inv narrowed at their transitions from S3 segments. Some of these thin loops have diverticuli or flaring at their distal ends (*). A was assembled from 3 adjacent Z-series and B from 12. Scale bar = 100 μm. Figure 7. Single-channel, two-photon microscopy with three-dimensional rendering shows longitudinal view of day P5, DBA-positive collecting ducts (B, inv/inv, 14 adjacent Z-series) that were diffusely dilated throughout their entire lengths except at proximal tips (arrows). Compare with normal caliber collecting ducts of +/+ (A, eight adjacent Z-series). Scale bar = 100 μm. Inset: immunoperoxidase staining with DBA shows cross sections of dilated collecting ducts (*) in two dimensions (day P1). Figure 8. Dual-channel, two-photon microscopy and three-dimensional renderings of collecting ducts (DBA lectin, green). (A) Day P5 +/+ with phalloidin (tan); image assembled from 2 adjacent Z-series; arrows point to proximal tubules; G = glomerulus. (B) Day P5 inv/inv with phalloidin (tan); collecting duct cysts with focal absence of DBA labeling at proximal ends are indicated with an asterix; P = proximal tubules with visible apical brush borders; image assembled from 28 adjacent Z-series. Scale bar for A and B = 100 μm. (C) Day P2 inv/inv collecting ducts with LTG-lectin checkerboard labeling of intercalated cells (tan) against DBA-positive principal cells (green); assembled from 4 adjacent Z-series. (D, E) Day P5 inv/inv with phalloidin (tan), 205 × 205 × 50 μm volume is presented in different rotations to emphasize heterogeneous labeling of epithelial cells within single cysts. Figure 9. 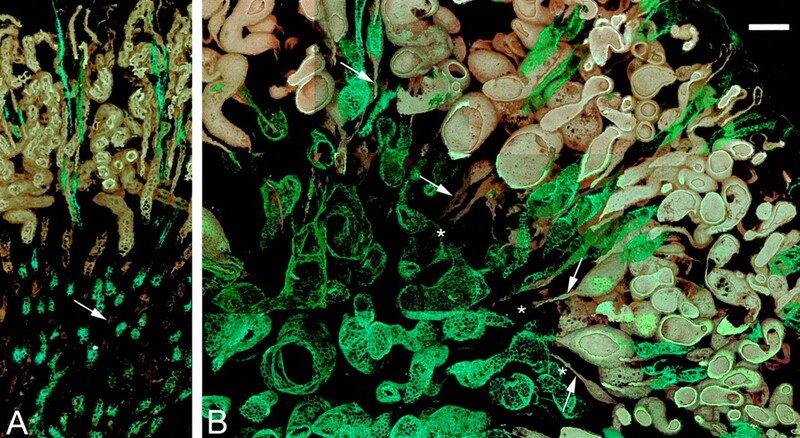 Dual-color, two-photon microscopy and three-dimensional rendering of day P5 +/+ (A) and inv/inv (B) outer medulla. Thick ascending limbs labeled with anti–Tamm-Horsfall (green) run parallel to DBA-positive collecting ducts (brown). Panel A was collected over a depth of 30 μm (single Z-series). Panel B was collected over 64 μm (two adjacent Z-series). Scale bar for A and B = 100 μm. Single-Channel, Two-Photon Microscopy of Proximal Tubules. In kidneys of P5 +/+ mice, proximal tubules of uniform caliber were found among compact arrays of cortical nephrons labeled with PNA or LTG (Figure 4, A, C and E). These lectins labeled apical brush borders, intracellular vesicles, and basal aspects of epithelial cells in proximal tubules of unaffected mice. A considerably different morphology was found in lectin-labeled cystic kidneys of day P3 and P5 inv/inv, which showed fusiform, not sacular, dilatation of convoluted and straight proximal tubules (Figure 4, B, D, and F through H) that were bridged by segments of normal or narrowed calibers (apparent in Figure 4, B and G). Within progressively expanding cysts, the apical brush border microvilli appeared to be either intact or focally thinned. Intact brush borders suggested that epithelial polarity is at least structurally intact in inv/inv proximal tubules. Rarified microvilli appeared similar to loose, ill-fitting pieces of jigsaw puzzles (Figure 4D). Fusiform dilatation of collecting ducts was seen with PNA labeling (Figure 4, B and D). Multicolor, Two-Photon Microscopy, and Segmentation of Proximal Tubules. To analyze proximal tubules in situ, Vibratome sections were labeled with two fluorescence markers (Figures 5 and 6⇑). PNA-labeled proximal tubules from inv/inv mice showed variable luminal widening and cysts (Figure 5, B through D). The interstitium appeared relatively disorganized and more abundant (Figure 5, B and C) when sections were dual-labeled with phalloidin. Similarly labeled +/+ kidneys had evenly dispersed glomeruli and uniform tubules with little intervening interstitium (Figure 5A). We used Amira software to determine the luminal pathway within tortuous convoluted proximal tubules (Figure 5, E and F), a task that proved difficult and time-consuming by 2-D (Figure 5, G through J). The lumen was analyzed, rather than the basal surface, because this space represents the route of urine flow that may be functionally obstructed. We identified normal, cystic, and narrowed regions within the lumen of a single, serpentine tubule. Although disconnected, blind pouches were not identified, there were cystic segments next to markedly narrowed segments that may function like blind pouches (between segments 2 and 4, 5 and 6, or 6 and 7 in Figure 5, D through J). Similar narrowing was detected where S3 segments transitioned to descending thin loops of Henle in the outer medulla, where occasional diverticuli were noted (Figure 6). Rare, small outpocketings were seen along proximal tubules (segment 4, Figure 5D). Single-Channel, Two-Photon Microscopy of Collecting Ducts. Collecting ducts from inv/inv mice were labeled with DBA lectin and imaged by two-photon microscopy (Figure 7). Composites of microscopy volumes showed that inv/inv collecting ducts were diffusely expanded up to 20 times the diameter of +/+. The caliber of inv/inv collecting ducts approached that of +/+ only at their immature proximal ends in the outermost cortex (Figure 7B). Like +/+, the inv/inv collecting ducts maintained their parallel alignment from medulla to cortex. DBA-positive cysts were easily identified by immunoperoxidase (Figure 7, inset); however, the 2-D nature of this technique gives the false impression that cystic collecting ducts are not parallel. Multicolor, Two-Photon Microscopy Shows Heterogeneous Labeling of Collecting Ducts. Figure 8 shows heterogeneous labeling of cysts arising in inv/inv collecting ducts that were dual-labeled with DBA and phalloidin, or DBA and LTG lectin. In collecting duct cysts in the outer cortex, there was loss of DBA labeling at many of the proximal tips (Figure 8, B, D, and E). This consistently occurred at the entrance and incorporation of distal tubule cells into the cyst wall, indicating that individual fusiform cysts can affect a region of tubule regardless of tubule segment boundaries. Further heterogeneity was demonstrated when both DBA-positive principal cells and LTG-positive intercalated cells were found in the same collecting duct cysts (Figures 6B and 8C⇑). Multicolor, Two-Photon Microscopy of Thick Ascending Limbs. In the medulla, anti–Tamm-Horsfall antibody labeled thick ascending limbs that were of normal caliber in +/+ kidneys (Figure 9A) but appeared dilated in inv/inv kidneys (Figure 9B). We used SEM to examine monocilia in renal tubules (Figure 10). In day P5 inv/inv kidneys, normal-appearing monocilia were detected at apical surfaces of cystic collecting ducts (Figure 10C) and proximal tubules (Figure 10D). By use of high-resolution TEM, we examined respiratory cilia from trachea of inv/inv mice (Figure 10E). Within the axoneme membrane, we were able to identify the normal arrangement of nine peripheral doublet microtubules around a central pair (9 + 2). Neighboring cilia showed parallel alignment of ciliary axes (data not shown) (37). Figure 10. Scanning and transmission electron microscopy of day P5 cilia. (A) +/+ kidney (original magnification, ×40). (B) inv/inv kidney (original magnification, ×35). (C) inv/inv outer cortical collecting duct (original magnification, ×5500). (D) inv/inv proximal tubule (original magnification, ×3500). Cilia on apical surfaces are indicted with arrows. (E) Cross section of 9 + 2 respiratory cilium in inv/inv mouse trachea (original magnification, ×52,000). The study presented here provides the first comprehensive analysis of cyst development and progression in kidneys of inv/inv mice. We observed a steady progression of corticomedullary cysts in inv/inv kidneys from embryonic day 15 to postpartum day 11 in a pattern resembling NPHP in humans. NPHP is characterized by corticomedullary cysts, thickening and attenuation of tubular basement membranes, tubular atrophy, periglomerular and interstitial fibrosis, and round cell infiltrates in the interstitium (7,38⇓). In familial juvenile NPHP1, Sherman et al. (39) described cysts in collecting ducts and distal convoluted tubules, and diverticula involving loops of Henle and the distal nephron. Gagnadoux et al. (40) proposed an infantile variant of NPHP when describing diffuse chronic tubulointerstitial nephritis characterized by microcystic dilatation of proximal tubules and Bowman’s space in seven infants who progressed to end-stage renal disease (ESRD) before age 2 yr. The suggestion that infantile NPHP may be associated with INVS was found in a Bedouin family with a mutation on chromosome 9q22–31, the synthenic region for murine Invs (41). This family was studied by Otto et al. (7), who reported Invs in mice is orthologous to human NPHP2, having identified nine distinct recessive mutations in seven families with NPHP2. All patients developed ESRD by 5 yr of age; three families had documented renal cysts and one patient had situs inversus. Early reports of inv/inv mice described cysts only in collecting ducts of newborns (24,27⇓). We show cysts in collecting ducts, proximal tubules, thick ascending limbs, and Bowman’s capsules that steadily progress from embryonic through newborn development. Normal and narrowed segments are identified within individual proximal tubules. Descending thin loops of Henle show narrowing and focal diverticula. Newborn inv/inv mice develop severe azotemia and most succumb to renal failure within 1 wk, consistent with the rapid disease progression reported in infantile NPHP2. However, we did not observe tubular atrophy and interstitial fibrosis described in NPHP2 because this chronicity is not likely to manifest during the short life span of inv/inv mice. At E15 the most mature, deep cortical glomeruli show dilation of Bowman’s capsule. By E17, proximal tubule cysts develop in association with the more numerous collecting duct cysts. Although collecting ducts may appear haphazardly arranged in 2-D, our 3-D imaging shows inv/inv collecting ducts run parallel along their expected linear path from medulla to cortex. During maturation these ducts uniformly dilate throughout their lengths except at their proximal immature tips in the superficial cortex. Cysts in inv/inv collecting ducts and proximal tubules are predominantly fusiform with rare lateral out-pocketing of renal tubule epithelial cells. Although isolated blind pouches were not identified, our segmentation of proximal tubule lumina did identify cysts bridged by narrowed segments that may function as blind pouches. Proximal tubules and collecting ducts from cpk mice also exhibit fusiform dilation while undergoing cystogenesis (32,33⇓). Out-pocketing of renal tubular epithelial cells in the pathogenesis of renal cysts is associated with human ADPKD (34) and is thought to be the result of loss of heterozygosity in the clonal cell that gives rise to a cyst. However, loss of heterozygosity in individual somatic cells is not required for cyst formation in ARPKD or NPHP in humans or mice, including inv/inv, because all cells in these cystic kidneys inherit two copies of the mutated gene. 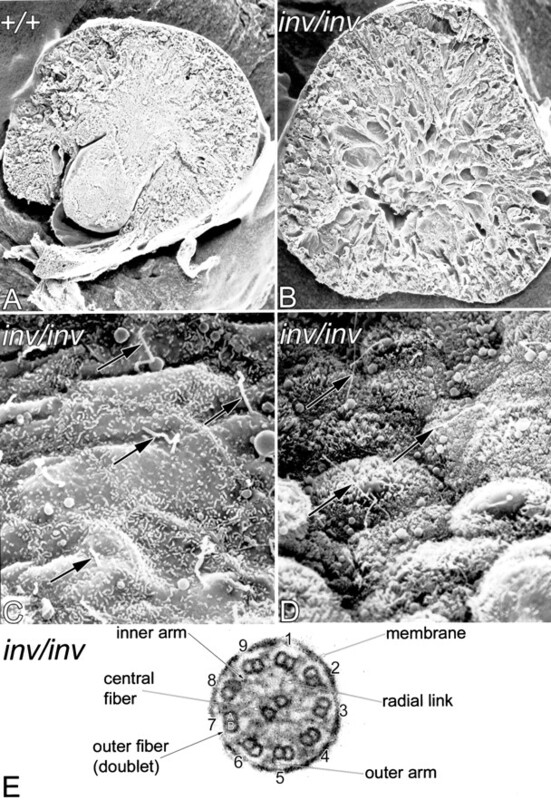 inv/inv kidneys showed complexity in shape and cellular composition of cysts. First, in proximal tubules, fusiform cysts are contiguous with either normal or narrow segments similar to linked sausages. Normal caliber tubule segments are found between the fusiform cysts in the cpk model (33). Because all cells inherit two mutated genes and only portions of proximal tubules develop cysts, there may be local factors contributing to cyst formation in inv/inv and possibly in humans and other murine models with inherited cystic renal diseases. Second, individual collecting duct cysts in inv/inv newborns contain a mixture of both principal and intercalated cells in a distribution pattern similar to +/+. This suggests that, in the inv/inv model, collecting duct cysts do not arise from clonal proliferation of a single mutated principle or intercalated cell because we did not identify collecting duct cysts composed entirely of DBA-positive principle cells or DBA-negative intercalated cells. Finally, we found that one cyst potentially may involve contiguous but heterogeneous tubule segments, such as cystic collecting ducts that uniformly lack DBA staining at the transition to distal connecting segments. Alternatively, this heterogeneous staining pattern may not represent one cyst formed across two distinct tubule segments but may in fact represent the loss of DBA staining in one cystic collecting duct. We favor the former explanation given the sharply demarcated staining pattern consistently lost at distal connecting segments (future distal convoluted tubules) of both cystic and normal collecting ducts. The diversity of cystic animal models suggests many proteins interact to ensure tubule integrity. Currently available murine models with PKD and NPHP (1) have supported the concept that many gene mutations may be responsible for cystogenesis. The inv mouse represents one model with renal cysts similar to human and other murine forms of ARPKD and NPHP but also has left-right asymmetry defects and cardiopulmonary (29) and hepatobiliary pathology (28). Cilia are postulated to establish left-right asymmetry (14) and have been implicated in renal cystogenesis (15). During early embryonic mouse development, asymmetrical currents generated by the vortical motion of nodal cilia are believed to establish the left-right axis. Praetorius and Spring (42) mechanically bent monocilia of cultured Madine Darby canine kidney (MDCK) cells and detected increased intracellular calcium that propagated as a wave from the perturbed cell to neighboring cells by diffusion of a second messenger via gap junctions. The first connection of cilia to cysts was found in studies of TgN737Rpw that is mutated in orpk mice. Partial deletion of TgN737Rpw results in cystic kidneys (43), but mice with Tg737Δ2–3bGal knockout allele have left-right asymmetry and defective cilia (44). Polaris, the product of TgN737Rpw, has been localized to axoneme of MDCK cilia (21), suggesting an intact cilia function is required for renal and axis development. Cystin, encoded by Cys1 and defective in cpk mice, is found in cilia (18). Although cysts of inv/inv exhibit structurally normal nonmotile cilia similar to the cpk mouse, functionally inv/inv motile cilia have been reported to generate slow, turbulent nodal flow (45). A subset of motile cilia containing left-right dynein appears to generate nodal flow that is sensed by nonmotile cilia containing polycystin-2 (46). Patients with ADPKD who inherit a PKD2 mutation have defective polycystin-2 but normal left-right axis (2). Individuals with situs inversus due to a defect in ciliary dynein arms do not develop renal cysts (15), and therefore, just having nonfunctional motile cilia cannot cause cysts. How defective cilia induce NPHP is unclear; however, data from several models clearly implicate ciliary function in the pathogenesis of renal cystic disease. The inv/inv mouse will be useful for the study of cilia defects and appears to represent a good model system for early infantile nephronophthisis. We thank Michael Goheen, Barry Babin, Michael Sanford, Olga Cabello, and Doug Kojetin for technical assistance and Heather Ward for reading the manuscript. Figures were prepared with the assistance of Jill Goodwin and Brent Gann. C.L.P. acknowledges NIH K08 DK02785, Polycystic Kidney Disease Foundation grant 99023, National Kidney Foundation of Indiana, Indiana University School of Medicine Biomedical Research Grant, Clarian Health Values Fund VFR21, and Ralph W. and Grace M. Showalter Foundation. Funds were also received from Deutsche Forschungsgemeinschaft (J.N. ), NIH PO1 HL49953 (P.A.O. ), Indiana University Strategic Directions Initiative (K.W.D. ), and the Indiana Genomics Initiative grant from the Lilly Foundation to Indiana University School of Medicine. Parts of this manuscript were presented in poster form at the national meetings of the American Society of Nephrology and the American Society for Cell Biology.